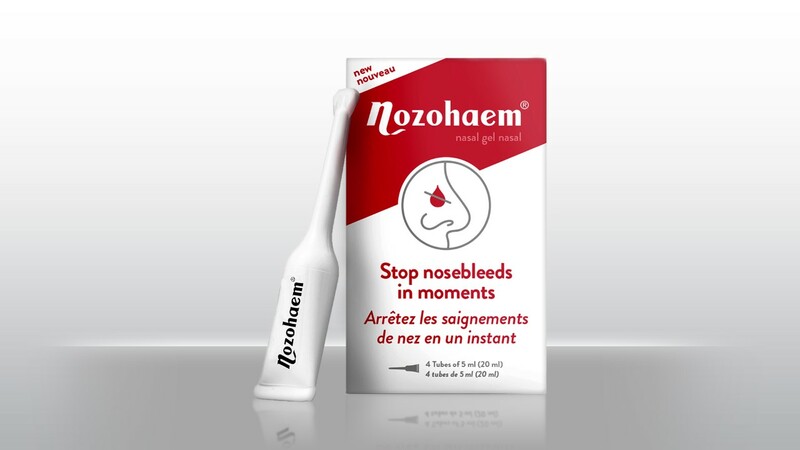 Nozohaem is a unique, gel treatment for nosebleeds that stops the bleeding in moments. Available from all good chemists without prescription, Nozohaem is safe, simple and quick to self-administer. Once the bleeding has stopped, the gel just dries away leaving no unpleasant taste. Nozohaem is a transparent nasal get that stops nosebleeds. The gel exerts gentle pressure to the bleeding vessel in the nose and hence stops nosebleeds. Nozohaem can be used by adults and children from 2 years of age. Individuals who suffer from recurring nosebleeds have blood vessels in their nose. As a result, the likelihood that the problem may recur after a Nozohaem treatment cannot be excluded. it is always a good idea to have Nozohaem available for if and when a nosebleed recurs. 2. Gently squeeze the tube to push all of the gel into the nostril with one hand while your other hand, thumb and index apply light pressure on both nostrils to keep the tip in place until the flow of blood stops. Sometimes a second tube may be necessary. 3. Wipe away any excess and allow the gel to remain in the nose for 30 minutes. Once the bleeding has stopped, the gel may be left in the nostril to clear away naturally or it may be gently blown out into a tissue. Looking for more information on Nozohaem and general knowledge of nosebleeds? Don't forget to download our catelogue!